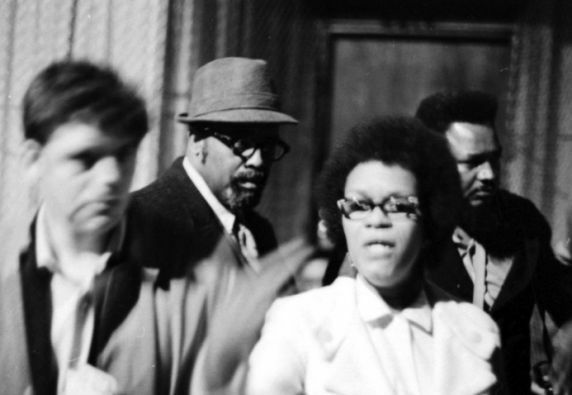 Nadine Brown, reporter and columnist for the Michigan Chronicle, addresses the press during a confrontation between Detroit Police and members of the Black Panther Party for Self-Defense (BPPSD). Ms. Brown served as an intermediary during the 9-hour stand-off and is credited with bringing the event to a peaceful conclusion by persuading most of the BPPSD members to come out of the Community Center that they occupied. The confrontation began when two police officers attempted to issue ordinance violation tickets to two men who were selling newspapers on the sidewalk. The accounts of what happened next vary, however, a fight broke out between the officers and members of the crowd that had gathered, back-up was called for and shots were fired. The nine 9-hour siege that followed involved nearly 100 police officers, and resulted in four police cars being destroyed by Molotov cocktails, one police officer being wounded by shrapnel and Patrolman Edward Smith being killed by a shotgun blast to the head. 15 young defendants, seven men and eight women, who had barricaded themselves in the Community Center were charged with murder and conspiracy to murder.